Our company was started in my father's basement by selling ozone machines on Ebay as far back as 2004. He came up with the novel idea to build a maximum strength ozone blaster that contained none of the unnecessary features that simply drove up the price of other machines. The idea was a hit and in 2008 I built this website to help promote our ozone generators to a global audience. Together we changed the industry. Now there are tons of companies copying our format and selling ozone machines across the internet. However most still rely on fake ratings and bogus reviews to promote their value. Below you can read over ten years of real customer feedback. Contact me to submit a review of your own. We are proud to maintain a satisfaction rating exceeding 99%. The unit works awesome! Thank you. Great simple design! Fast shipping! Thanks!! Very happy with purchase works great Quick response to ??? well packaged! Seems like great product. Totally satisfied. Works Excellent. Fast Shipping. Thank You. Item Received as Described. Fast Shipping. Good Seller! Quick to respond. Excellent product. Works as advertized. Don't expect communication unless you start it. Shipped on expect delivery day. great transaction -- highly recommend! Arrived quickly and works as described, great product and seller! Great ebayer!! Thanks for quick payment! shipped quick - is as advertized - will see how well it works upon use! A Pleasure To Deal With, Highly Recommend!! ***Very powerful unit. Smaller and stronger than Air-zone. Super fast delivery! Great product. Great seller! Fast and free shipping! Great ebayer! Thank you! Can't wait to try it out! Holy Smokes! I mean, Ozone. This is going to be good. Fast ship...just as described. Thanks! Delivered quickly and works as advertised. The extra $ for the toolbox is BS. Item as described; good communication; quick shipping, recommended eBayer! Thank you ! Just what we needed !! Great Product, prompt shipping! Very Satisfied! Love this unit. It is doing wonders in getting rid of 20 years of cig smoke. This is NOT the same as identically-appearing units - MUCH BETTER! Thanks! Fast Delivery!!! Good Communication ! Highly Recommend!! Recommend to all. Perfect Ebayer as listed and timely! Received in less than one week. Works well. Thank you for the fast delivery. Im anxious to try it out. Amazing how well this thing works. Thank you. Great ozone machine works well. Unit works fine, seems to be well built. quick shipping, As described. This thing REALLY WORKS!!!!!! Just as described, shipped quickly, great communication, highly recommend!!! Quality made and powerful - took care of the odor within an hour! Thanks!!!! Fast shipping and exactly as described. It works awesome! Very high quality too. waited on feed back 2 c how well it works with fire smoke, it works great,yasou! GREAT PRODUCT, PLEASURE TO DO BUSINESS WITH. Great product! Made my 10 year old car smell like new. Very good working order,I will buy from you again thanks. Good to deal with and can be reached by phone. Works great...It removed the odor fairly well. Recommended! Thank you, Unit works great in my Limousines. Worth the wait! smooth transaction, item as described, prompt shipping. recommend. EXCELLENT! EXCELLENT! EXCELLENT!!!!!!!!!! Machine Does Exactly As Stated!!!!!!! WOW!!! The MaxBlaster killed odors from rodents living in the walls. great service will buy from again. Longer ship time than expected. Seems to work fine and price was good. Excellent seller fast shipping Very helpful! I received the item sooner than expected. The MaxBlaster performs as described ! a great item this one works GREAT!! thanks i love it! fast delivery and shipping, great product.Thank you. Wonderful customer service! Great seller! Awesome Machine, Does what advertised, also fast shipping $ well spent .Thanks! awsome machine works better than described!!!!!!!!!!!! great device....actually works better the decribed!!!! shipping was a little slow but product and service are AMAZING! THANK YOU!!! As described & quick shipment. THIS UNIT IS SERIOUS-I have the Oasis($1,728.00 from JonDon.com)BLOWS IT AWAY!!! Ridiculously Powerful - Great value -I used in my vechicles and home. Thanks! Unit works great, thanks for your help. Thanks for the ULTRA EFFICIENT GENERATORS & your fast shipping! 1A+; a 10 PLUS ! Very fast shipping, thanks so much!! Great Ebayer A++ GREAT Customer Service - Works GREAT pleasure doing business !! Fast Shipment!!!!!!!!!!!!! Works like a charm!!!!!!!!!!!!! Thanks!!!!!!!!!!!!! Fast quick service A+++ Cleaner Air! Excellent Unit ,,, Heavy-duty!!!! Safe and fast delivery!!!!!! Great Works Fantastic Clean Fresh Air Quick Ship Packaged Great! great machine!fast shipping,will gladly buy again! Awesome Machine, Great Deal and fast shipping $ well spent .Thanks! First rate service. If you have a problem, they fix it!!! Just as described. Fast shipping. Great to deal with. Thank you. exelent response and exelent machine. Good seller, responsible. Very good communication. Nice people, Had some shipping and email issues but all has been worked out. Super fast shipping!!! Item just as described. Item as described, packing was excellent. Fantastic machine. Would do business with again!!! no response to my email but Item was delivered and seems to work amazingly well. Thanks Tom! He is an honest, trustworthy seller. Just as described. Worked awsome! smooth transaction, works very well. I am very pleased! Ozone gen. works good, great Ebay-er, recommended seller! This was the best company I have ever done business with. 5 STAR!!! Quick Ship and a great value. Thanks! Good Seller, smooth transaction, as described. High Quality product and works like a charm. Would buy from this seller again! Item just as described. Nice transaction. Thanks. Very rapid shipping. Good communicator. Fair price. Good quality product. A+++! Very helpful and GREAT to work with. The Best. Fast Shipping, Quality Product , Great Seller I will buy again and again !! recieved very quickly, great machine, Thanks!!!!!!!!!! Excellent product, rapid shipment and great comunication. Highly recomended !!! Very good seller and prompt shipping. Got it sooner than expected. Works well. Excellent output for the money, smooth transaction. Great Deal. -Thanks! Product arrived in good condition & quickly THANKS!!!! VERY FAST delivery. Great unit, recommend!! Great item! Was carefully packaged for a quick shipment! Prompt, excellent packaging, good communication, patient, good seller. The product works well. Great price. Thanks! It works great and quick shipping. I am happy with this O3 generator. unit was defective, sent me a replacement asap. Will order again! Excellent Machine, & Great Seller to Work With! Thanks Very Much! Everything fine - happy buyer! good strong ozonator . I am happy with my machine. Thanks for the superb device. Very positive experience. UNBELIEVABLE !! There is not enogh space to bragg about this seller !! Thanks! Great Seller, awesome product, and the best price !!!! Shipped fast, packed well. THANKS ! Fast Shipping! GREAT product! Thanks! I highly recommend this to anyone who is trying to decide if this works. WOW! This guy is one of the good ones! Very trustworthy person Thanks for everything! Awesome seller, very friendly, trustworthy and helpful. Nice oz gen. Thanks Tom! Excellent seller!!! No problems at all. Remember customer satisfaction? This ebayer beams with it! Customer for life! Ran into a problem, seller went the extra mile to get it resolved for me. Great communications! Delivered as promised. Great value, great seller! Gorgeous sterling! Fast shipping; WONDERFUL seller--THANKS so much!!!! Thank you very much for MAXBLASTER! We received the PRO unit yesterday... What a BLAST!!! Your website description of this machine is highly understated . This unit puts out more and purer ozone in ½ hour than machines of equal cost produce in one whole day. (I used to sell and repair medical equipment for medical professionals and institutions). You have traded pure ozone generating power in exchange for high price and marketing gimmicks of confusing, user unfriendly, unnecessary, unwanted circuitry and short machine life of other manufacturers. It is my suspicion that non-essential circuitry makes up huge portions of the cost of most ozone generating machines: • Timing controls • Intensity controls • Frequency controls • Plate Select controls • Fan Speed controls • Remote controls • &c. When unnecessary circuitry is contained within a machine's casing, ozone generated within the unit corrodes circuit boards, components, connections and insulation, resulting in shortened system life. Plus , ozone degeneration of plates, circuitry and insulating material results in reduction and contamination of ozone gas emitted from the generator. Having owned several different machines of various manufacture, I am telling you: My search for ozone generators is over! Your machine is perfect for my needs. It is endless in application (home, industrial, commercial, institutional, medical, personal, hygenical,, food preparation, food storage, &c., &c.). No one paid me for this evaluation. The above statement(s) may be reproduced, published, used completely or in part for private or commercial purpose as you see fit. I wanted to let you know that Your product is amazing. We have a cat that got real sick in our Jeep Liberty on the way to the vet and to top it off another cat got into my Jeep when I left the windows down a few days later and sprayed all over the inside of the vehicle. Man, I tried everything. Air fresheners, baking soda, odor eaters, totally soaked the carpet with carpet cleaner and vacuumed it out, even sprayed underarm deodorant all over the upholstery and under the seats. It really stank!!! Worse in hot humid weather. Well one fifteen minute session with your ozone machine completely, and I mean totally knocked the problem out. You are welcome to use my testimony if you want to. It was great to buy something that more than did what it promised. Thank you for your quick response it helped us greatly with the attic. We ran it like we talked about with the Maxxblaster positioned on the ladder and it seemed to work very well. We did the three short period treatments like you suggested and when Sal's folks arrived there wasn't even a mention of the bad smell. It's now a week later and we still cant smell anything, although we did run it again over the weekend just because we liked the smell after the treatment. I look forward to getting the hose attachment soon. Thanks for all your assistance. I just wanted to thank you for rushing the max blaster out to me so quickly for my 'emergency' situation. although it turned out to be not as bad as we discussed the max blaster really did an amazing job of clearing up the smoke odor part of the project. We used it like you suggested room by room and it was easy as heck... much simpler than I thought. Anyways, I appreciatte the good service, friendly advice and great product. I should be getting more once we land the second part of this job with the additional 100+ rooms. Thanks again, have a good summer! Re: Thank you for your order! everybody excited to try it. impossible to wear and difficult to ozone. gave them your website. I will need another unit since mine is still in Ill.
will result in a significant number of sales. Might as well be you. along please don’t hesitate to let me know. Got the package from the post office today. Thanks for putting a rush on the order. Man, we used it for a few hours downstairs and it's doing a great job so far. Hope to have everything done by Monday, at this rate were looking good. Thanks for your advice on the phone. Im looking towards buying a few more down the road for the shop now. Talk to you soon, thanks again! Very happy. Thank you thank you thank you... the Masterblaster (maxblaster) saved us... we followed your insturctions and used it in the living room last thursday. We ran it exactly as your described over the weekend just in time for the air to be almost totally free of any scentby the time Garys folks made it. We plan on running it some more this week, just to be safe, then on the program cycles you described. Thank you again also for moving us ahead in line a little for shipping knowing how urgent it was... I know you guys are busier than ever (that's so great) and how inconvenient it probably was for me to call so rushed and frantic. So thank you, we reallty like your product, and that your company is in USA and growing! We will mention this to Garys boat owners association and you may just get some more biz from us. Hey just wanted to tell you we got the machines after the slight hiccup with the shipping address. I appreciate you looking into and correcting the address on the labels so we didnt have to bother. By the way, the machines work TREMENDOUSLY so far. Cigarrete odors in the basement we discussed were blasted away in less than 48 hours, and we now can use it for functional space. I really appreciate your advice and follow through... thank you, best of luck with your growing business!! From: "julio @ suite sixx auto"
Thank you for the rush service. It really helps seal the deal. But the real bonus came when we ran the machines. These are like having 3 or 4 of our 'other' machines. We started using them on just about every car and it seems to be working great so far. How often do you think I'll need to replace this gen pack given how wet our conditions are? Please advise. And thanks for the great help and the strong machines... we look forward to getting another 10 real soon for our growing business... just like yours! Finally got the Max Blaster. Getting ready to start the first treatment. Question- Can I attach this spout outlet and tube thing to the inlet end of the machine instead of the outlet end? I turned on the machine and BAM it puts out tons of ozone... much more than the (name withheld) I used before buying yours. Almost makes up for the looong shipping times. We'll see in the end- hoping for the best. *editors note- we don't just publish the responses that are 100% positive. We admit as we've grown (almost too fast) it is very very tough to keep up with fast shipping times during the busy season. We are expanding our facility as we speak to allow for same day shipping in spring/ summer 2011. Thanks to all those who waited patiently for your machines to arrive over the last few, demanding months. Greg M.
and had a great, clean/fresh smell. Thanx!! Thanks for the great machine. I finally got to use it and the bed bugs seem to have gone away completely... for now at least. Man this Maxblaster puts out a ton of ozone. I had another ozone generator that was all shiny and flashy but it stunk as far as ozone capabilities. Your maxblaster blows it away. I intend on running the second application today like we discussed to kill the eggs. This ozone generator machine is hugely valuable if it kills proves to kill these bed bugs. The problem's been real big. Good luck and thanks for the powerful ozone machine. information manuals I have ever read. decaying critter stuck in the walls of another home! Amazing! after the purchase. We would highly recommend your product to others! companies out there who do not meet that standard. Thanks again. Thanks again... the ozone generator was well worth it. used it for the car first and it worked great. 3 2-hour treatments from outside the car and the odor was completely gone. The money was worth it just for that. Then, used it on the closet with the gear as we discussed. Again excellent results. Thank you for communication throughout. Best of luck with your busy demand. Hey Greg just a quick note to thank you for your good service. And for an amazing ozone generator... MAN, this thing cranks ozone. Even though I got a little worried when it didnt show up as fast as I wanted I understand things can get hectic for a young company when demand goes up so fast. What was most important is that you communicated this to me AND that the ozone generator was exactly as advertised. I look forward to buying more... thanks again for taking the time to speak with me on the phone for so long during your busiest season. generators... in case I need more. and went ...Wow! ... holy "bleep". Website looks awesome. New logo looks awesome too! Glad things are going good and wish you guys all the best. my only complaint right now is, I wished I had more. Thank you for all of your help in getting my Maxblaster. Your customer service is as good as it gets! Within an hour of receiving it, I put my new Maxblaster to work. I do crime and death scene cleaning. As part of our remediation process, we always treat the area with ozone to eliminate odors and other volatile organic compounds. The machine I was using was adequate, but it always took more time than I wanted to spend. Thanks to my new Maxblaster, my ozone treatment time has been cut by a factor of 4. Meaning I only need to use the Maxblaster 1 hour as compared to 4 or more with my old machine. I consider this to be money in the bank. After all, time is money! If anyone is considering buying an ozone generator, do yourself a favor and buy this one! I did months of comparative shopping and it all boils down to the output of ozone. The Maxblaster is so powerful compared to most every other machine out there. 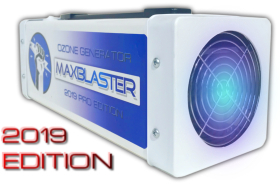 I even saw ozone generators selling for $2100.00 to over $3000.00 that do not produce the results of a Maxblaster. I am so confident this will work for your needs, I have given Greg my toll free number (877-581-7759) and have offered to have any potential buyers call me personally for my opinion. My Maxblaster paid for itself the very first day. Simple, easy, effective, incredibly well built and powerful is how I would describe the Maxblaster. This is now my favorite piece of equipment. I wish I would have purchased a Maxblaster years ago. It works and works well. Thanks Greg, the Maxblaster and your company are just terrific! I have had great results so far with the new MaxBlaster. The results generated a reference and a thank you letter for de-smoking a hotel and training complex. That letter immediately found its way into my next janitorial bid package and was the focus of my potential customer in the bid presentation. I will be surprised if I don't get the bid. I do have a question however. I haven't any idea what to charge for my service. Do you have any support in the area of pricing? If it's easier for you, I'll get the timer and box myself and you can forward the $40 through paypal. Do you need any further info from me to do so? Thanks for all your help. I do understand that things can go wrong despite our best efforts. I'll leave a positive feedback on Ebay despite the problems. And - the machine is great. I used it on a client's burnt house where the refrigerator has been sitting full for 4 months and the whole house stunk of rotting food. I tried it for 4 hours, but that didn't work as the house had some openings. I did it again for 9 hours and the house had no smell of rotting food or smoke at all! Also used it on the moldy smelly basement and it worked perfectly.